Who would be interested in artwork of their Z? 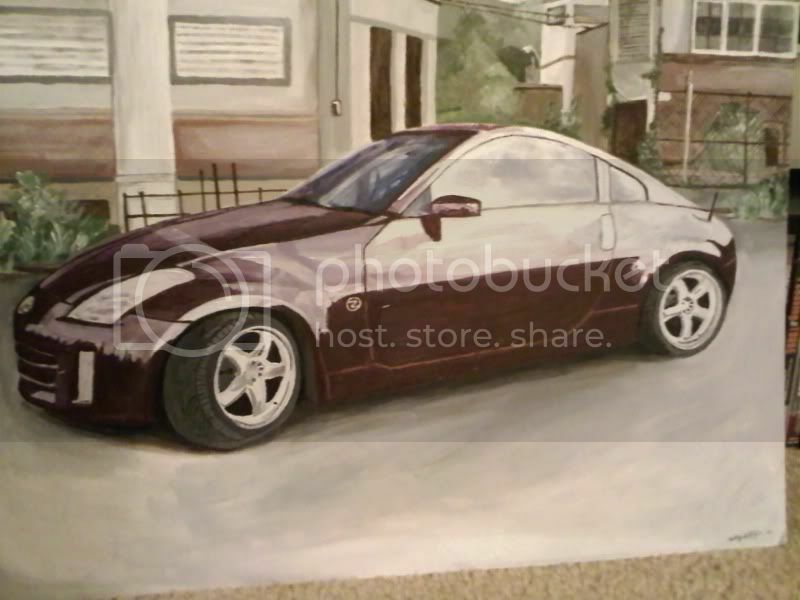 to be more honest.. she needs more practice plan and simple.. dont compare her work to other paintings that have sold for $40k.. its not about someones style or not.. its a car.. it has to be the perfect shape and more balanced, the wheels dont look right, the back looks small the door looks huge, it looks like the one i drew when for my art class in 11th grade. but the front bumper does look pretty good.. if it was a great painting then im sure it wouldnt be hard at all to get some of us to buy one from her and there wouldnt be a need to convince anyone. Need more pics on the subject towards the bottom of the last photo!!!! So far the Z looks good show us more later. I'd be interested but if its like the first photo I wouldn't pay anything. If its almost exact then I'd pay. I can send you a pic of my Z as it sits now and you can do the pic and if its good then I'll send cash. Also you can use it to advertise if its good instead of the pic you currently have. Not trying to bash but just not to the quality I'd put money on. Agree with most on Car Art is difficult, and its not subjective. If she can define the shapes properly, then yeah, but from that I can tell you she needs more drawing classes, cuz I can draw this..
perspective is wayyyy offfff.. impressive color , but anyone can do that from a picture. ^ Sorry but honestly, more practice needs to be done before considering to put out art that people will actually pay for. not claiming to be an artist myself, i'm just saying. Is that a crotch shot? lol yes, why would you post a pic of your gf like that? tell her to show moar now!~!!!!! Last edited by LuciaPwNs; 03-16-2010 at 02:31 PM. Quick Reply: Who would be interested in artwork of their Z?